Hi Guys, Today I Am Back With Another Paytm cash offering product, Now Paytm is going up day by day and it is Used To Partner With Many Brands by giving Free Paytm cash Codes , We have Already Seen many such products. 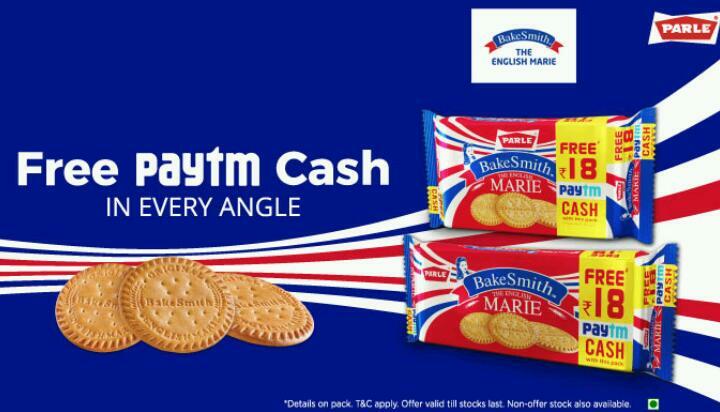 Now here is another one, Paytm Partnered With Parle Bakesmith Marie & Giving Free Rs.18 PayTM Cash on every pack. This is a Free Paytm Cash offer that is running on the Parle Bakesmith Marie 250g (in All India except East zone) and 300g (in East zone) packs, available at Rs. 28 and Rs. 30 on different packs. The promo code can be redeemed until 15th February 2018. Now just follow the below instructions to successfully redeem your voucher! 3. Now Just Click on Add money. 4. Now You will be asked to ‘Enter Amount to be Added in Wallet’. 4. Enter the unique promo code mentioned in the inner surface of the pack. 5. Now Proceed by clicking on add money. 6. On successful completion of the process you will receive Rs.18 Paytm cash instantly!